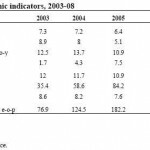 Annals of Resurgent Russia – It’s the Economy (in 2007), Stupid! Twice a year the World Bank files a Russian Economy Report. The last one was in November 2007. Let’s look at its first chapter – “Recent Economic Developments”. It does what it says, i.e., condenses Russia’s economic situation in 2007 into a few pages of dense text, stats and charts. Russian economic performance remains robust. Having grown by 7.9% (year on year) in the first half of the year, Russia is likely to post full-year GDP growth of over 7% in 2007. Output growth was driven by rising domestic demand, in particular, buoyant household consumption and business investment. On the supply side, sectors servicing the domestic demand (construction and retail trade) continued to boom. Manufacturing growth remains solid but is tapering off. The negative contribution of net exports to GDP growth is explained by the real appreciation of the ruble, which is making Russia’s exports more expensive abroad and imports less expensive to domestic consumers. In a context of an economy growing close to potential, with high energy prices and large capital inflows, Russia faces two main challenges: inflationary pressures and rapid appreciation of the exchange rate. The most notable monetary development in 2007 is the surge in inflation. While it remained under control in the first quarter, inflation kept gaining momentum in the remainder of the year. Inflation reached 9.3% over the first ten months of 2007. Most likely, end-of-year inflation will reach 11 percent (Dec/Dec) compared to 9% in 2006 over the same period. The surge in inflation is explained by rising world food prices and by monetary factors. Large capital inflows pushed the balance of payment surplus to record highs and are becoming an important source of reserve accumulation ($450 bn). However, unlike oil revenues, capital inflows are not absorbed by the Stabilization Fund, driving money expansion and exerting upward pressures on the ruble. Given limited monetary instruments for sterilization and the current stance of monetary policy (that limits the pace of nominal exchange appreciation), reducing inflationary pressures is becoming exceedingly a difficult task. The Russian government continued to enjoy fiscal surpluses. The federal budget surplus reached 7.1% of GDP over the first nine months of 2007. But the approved 3-year budget entails a fiscal relaxation that under the current oil price outlook would reduce the overall budgetary surplus to 0.2 percent of GDP by 2008. The amendments introduced to the budget 2007 law entail an increase in non interest expenditure that would bring the budget surplus down from 4.8% to 2.8% at the end of 2007. These amendments aim at increasing public investments in priority infrastructure and social sectors with a view of boosting growth. However, raising public investments might not be enough to close Russia’s infrastructure gap and drive sustained economic growth. Keeping up private investments and improving the efficiency of investments will be as important. In addition, the pace of fiscal expansion needs to be studied carefully to avoid exacerbating tensions between fiscal and monetary policies. This year GDP growth and industrial production have remained buoyant. GDP increase is powered, as in the year before, by growth in household consumption (9.8%) and capital formation (28.5%), as compared to 2006 figures of 8.5% and 11.2%, respectively. Between them, in the first half of 2007 they contributed 6.7% and 4.4% growth, respectively (because consumption and investment make up about 60% and 20% of GDP, respectively), compared to 5.9% and 1.8% in 2006. It could now be fairly said that Russian growth is no longer overwhelmingly fuelled by increases in consumption – investment has become a major mainstay, too. However, net export has contributed -3.7% (it was -1.4%) thus far, thus giving GDP growth for H1 2007 as 7.4%. The sectors servicing the domestic market continued to boom, particularly the non-tradables (construction and retail trade), due to rapid real income rises. Manufacturing growth was solid, at 10%, but is not sustainable (it was due to exceptionally large increase in infrastructure orders for machine-building and an unusually warm winter). Latest Rosstat estimates suggest that industrial growth, and in particularly, manufacturing growth, slowed down in the third quarter of the year – preliminary statistics for August and September already show manufacturing growth of only 5.5 and 4.0% respectively, compared to 6.2 and 5.1 percent last year. Extraction is growing particularly slowly, with oil extraction increasing slowly and gas production stagnant. Manufacturing has had a steady trend of decline, from 9% growth in 2003 to 6% this year. While manufacturing that services booming domestic demand and is not readily open to imports can thrive, ruble appreciation is driving up unit labor costs, suggesting that wages are leaping ahead of productivity – and thus reducing the competitiveness of manufacturing sectors. The Russian economy continued to experience an investment boom, but levels of investment remain low relative to GDP (21%) and concentrated in the non-tradable and resource extraction sectors. The aggregate fixed capital investment grew by 21.2% in the first nine months of 2007 compared to 11.8% growth reported for the same period in 2006. While capital investments decelerated in September 2007 they still posted double-digit growth rates (16.1%, relative to the same month in 2006). Foreign investment surged, as we have already documented on this blog – however, FDI remains concentrated in resource extraction industries and non-tradable sectors, playing only a marginal role in manufacturing. The current account surplus continued to decline on account of the rapid acceleration of imports and weak export performance, declining to 57.1bn $ in the first few months of this year, as opposed to 79.1bn $ in the same period last year. Thus the trade balance declined by 17bn$ from an estimated 94.1bn$. Booming consumption due to income growth has fuelled very rapid import growth, while exports are undermined by manufacturing uncompetitiveness due to rising labor unit costs and low/stagnant resource extraction. However, the weakening of Russia’s current account in 2007 was more than compensated for by the strengthening of the capital account. The surge in capital inflows pushed the balance of payments surplus to record highs and exerted new upward pressures on the ruble. The pace of reserve accumulation has increased further in 2007, with the gross foreign reserves of the Central Bank reaching 447bn $ by October 2007. Inflation is rising since April 2007, driven by international food prices and rapid money expansion. Inflation remained largely under control in early 2007 on account of lower increases in food prices reflected more favorable weather conditions and higher food production, but since April 2007 inflation kept gaining momentum. CPI inflation during the first ten months of 2007 amounted to 9.3% compared to 7.5% during the corresponding period of 2006. Inflation increased in September 2007 mostly on account of rising food prices. Latest estimates show that CPI inflation for the first ten months of 2007 reached 9.3% – well above the government’s initial year-end target of 8%. Actually, total inflation for 2007 was 11.9%. A close examination of the basket of goods used to calculate CPI reveals that the increase in inflation can be attributed to two sets of prices: food prices (meat, milk, bread, fruits) and non-tradables (construction, communication services). Prices for meat, milk and bread increased considerably more in the first ten months of 2007 than during the corresponding period of 2006. However, prices for construction materials and communication services have also increased, suggesting that part of the surge in inflation is coming from non-tradable sectors in an environment of a rapid money expansion – since the second quarter, money supply grew faster (22.5%) than during the first months of the year (11.2%). In response to the surge in inflation, the government resorted to temporary administrative measures including price controls, export tariffs and cuts in import tariffs – while these measures could contribute to bring down inflation in the short-term, they introduce distortions in relative prices and their effectiveness in the medium-term is limited in a context of rapid money expansion due to booming domestic demand and large capital inflows. Because of monetary policies aimed at checking ruble appreciaton, Russia is deprived of the ability to channel away these capital inflows to its reserves, like it does with oil earnings. Federal budget revenues were 5084.8bn rubles (22.5% of GDP, down from 23.5% in 2006) and spending totaled 3483.7bn rubles (15.4% of GDP, up from 14.8% in 2006), generating a surplus of 1601bn rubles (7.1% GDP). Much progress was achieved in budgetary management reforms in 2007 – treasury management of the budget, a medium-term fiscal framework (a 3 year budget), and oil revenue management funds (Oil Stabilization Fund and a National Welfare Fund, that will accumulate oil revenues beyond a ‘reserve fund’ of 10% of GDP). The fiscal stance has become increasingly relaxed, envisaging a balanced budget by 2009-2010 under the current oil price outlook. The 2007 budget ended up being revised in the Duma to 20.4% (from 17.5%) of GDP. The bulk of the planned increase in public expenditures goes to infrastructure development and social spending. About 640 bn rubles of the additional spending (of 1068bn rubles) will go to the capitalization of several state corporations and funds – the Bank for Development, Russian Nanotechnology Corporation, Investment Fund, Fund for Housing reform support) to increase public investment into infrastructure and strategic sectors in order to boost long-term growth. The bulk of the remaining funds will go to social protection expenditures (pensions of military personnel and transfers to the Pension and the Medical Insurance Funds), and ‘National Economy’ (road-building and flood-prevention construction works, and capitalization of ROSSELKHOZBANK, Russian Agricultural Bank). Rapid GDP growth, labor market shortages and boosts to public salaries and pensions contributed to fast income growth. A warm winter and an increasing demand for labor in the majority sectors of the economy have positively contributed to the reduction in unemployment. The data is summarized in the table above. Forbes offers an article on Russia’s ‘surging economy’, describing the main developments of 2007 and sketching events that might impact on the Russian economy in 2008. With the firm belief that, especially in Russia, past is prologue, the first and most important economic trend of 2007 was that nation’s continued political and economic stability. This has made possible, and will continue to enable, reliable forecasts of economic trends, and has attracted a great deal of foreign investment in Russia. Such an ongoing process has also caused Russian entrepreneurs to maintain and increase their domestic investments, rather than invest abroad, as they did before. Moreover, it has resulted in job creation and stimulated economic growth, which is now approaching 8%. This is comparable to India’s growth rate, but from a much higher base. It is also well above the rest of post-communist Europe (with the exception the Slovakia and the Baltics). Which indicators are proving the increasing stability and predictability of the Russian economy? First, there’s the unprecedented rate of growth of foreign investment, which surged by a factor of 2.5 in 2007. None of the world’s 15 leading national economies can compete with this achievement. Some $100 billion was invested in Russia from abroad over the last 12 months, an all-time record for any emerging market country and a milestone of great historical and psychological significance for Russian business. One negative trend of 2007 is the steady rise in prices of consumer goods and food, a very dangerous development. The consumer price index surged 12%, but the price of certain foods has risen at a much faster pace–vegetable oil increasing by 150%, butter by 40%, milk by 30%, and grains and bread by 25%. This is not the result of a worldwide increase in food prices–Russian food prices are growing faster than world prices, even faster than in neighboring emerging market economies like China and India. But not by much – Chinese food inflation in November was 18.2%, including 56% on pork and 39% on poultry. Still, every cloud has a silver lining. Vegetable oil, butter and milk are all part of the reason Russia has some of the world’s highest rates of cardiovascular diseases. Nobody will starve, but some will switch to healthier options. compared with the cost of production. This means that this compressed “price spring” will expand in 2008, resulting in a sharp increase in gas prices for consumers, as well as prices of first necessity goods. Despite growing prices for natural resources and raw materials, Russia’s positive trade balance has shrunk, because imports are increasing faster than exports–which may be a dangerous trend, and likely to continue in this year… Production volumes, and hence exports, are almost stagnant; meanwhile, appreciation of the ruble makes manufactured exports uncompetitive and imports easier to afford. In other words, Dutch disease – although since Russia gets very little from non-primary exports anyway, this is not a big concern. Finally, there has been fast growth in the amount of debt accumulated by Russian consumers. It is interesting that ruble debt has grown twice as fast as debt in foreign currency, which has not been the case in previous years. Taking into consideration Russians’ general lack of experience with credit obligations, the possibility exists for a wave of bankruptcies in 2008. This is a result of the spread of easy credit to the general population – merely a sympton and result of modernization. Johnson’s Russia List in its Research and Analytical Supplement RAS No. 41 (Jan 2008) has included 3 articles in its Economy sections. The first is Russian Economic Prospects, a summary of Philip Hanson’s The Russian Economic Puzzle: Going Forwards, Backwards or Sideways? Since 2003 there has been a shift to greater state ownership (although some privatization continues) and direct state intervention in business affairs. State ownership in the oil industry rose from below 20 percent in 2004 to over 50% in 2007. There have also been state acquisitions in banking, engineering, and even metals. But the impact on the economy as a whole has been modest, with the private sector share of GDP declining from 70% to 65% since 2000. There seems to be no intention to extend state control far beyond “strategic” sectors, especially hydrocarbons and defense-related industry. He goes on to argue that the initiative for strengthening state involvement from the economy comes from Kremlin ‘sovereign democracy’ ideologists like Surkov, harkening back to Russia’s historical traditions as a patrimonial state. There is a caveat, however – this is a nativist, rather than a statist, sentiment. In other words, industry can be owned by either the state or patriotic Russian business magnates willing to do the Kremlin’s bidding if called upon. Those with KGB links are especially preferable, while ‘offshore aristocrats’ (like members of Yeltsin’s ‘Family’) are not welcome. In conclusion, Russia is developing into a dual economy – its ‘commanding heights’, the strategic industries, are under state control (Lukoil, Rusal, Severstal, Norilsk Nickel) or outright ownership (Gazprom, Rosneft, Rosoboronexport, United Aircraft Corporation, United Shipbuilding Corporation, Atomenergoprom, Rosnanotekh), and coexist with free enterprise in the rest of the economy (transport, retail, communications, etc). In other words, a corporatist state. In Da Russophile’s view, the 65% of the economy that is non-strategic is by nature also the most dynamic one. Notice how all the strategic sectors are linked with industry (manufacturing or extraction). Russia is at a stage where the highest growth is going to come from improving productivity in services, not industries, and this is evident in economic growth today, which is highest in retail trade, construction, IT and the financial sector (i.e., non strategic sectors). What we do find unsatisfactory is that the government time spent on these strategic industries could be much more productively employed to ameliorate the poor microeconomic environment (Russia is 106th in the world for Ease of Doing Business). The second article, Using Reseves (summarizing Russia’s Gold and Foreign Exchange Reserves and Areas for their Rational Use by V. Belkin and V. Storozhenko), argues that Russia’s foreign currency reserves are far too high from their optimal level. It alleges that “many important state programs are grossly underfunded and for that reason cannot achieve their stated goals” and that it would be a good idea to spend reserves on alleviating specific socio-economic problems. The third and final summary is of Ownership Concentration and Russian Company Development by T. Dolgoplatova and Russian Holding Groups by S. Avdasheva. The authors allege there is a high concentration of ownership of Russian companies and that it continues to increase – a negative development in view of their finding that corporate governance is best in those companies with a moderate concentration of ownership. Finally an article from the Economist – Russia’s booming economy, from June 2007. I’ve decided to quote it in full because it just bulges with the kind of comprehensive details that are essential to have a good understanding of any economy. Russian economic growth hit a six-year high of 7.9% year on year in the first quarter, propelled by strong growth in construction, manufacturing and trade. The result is particularly impressive in light of the small contribution made by oil and gas. Although economic growth is likely to ease during the rest of the year, robust domestic demand may ensure that the full-year rate does not slow appreciably from the 6.7% outturn seen in 2006. State statistics agency RosStat released full first-quarter GDP data on June 14th. The main factors behind the 7.9% headline growth figure were a 23.2% rise in construction, an 11.8% expansion in manufacturing and a 9.1% increase in trade. Large gains were also registered for hotels and restaurants (13.9%), the wholesale and retail trade (9.1%), financial intermediation (9.9%) and transport and communication (7.9%). In the year-earlier period, GDP growth was 5% and in the fourth quarter of 2006 it was 7.8%. Base-period effects partly explain the recent strong showing, as the first quarter of 2006 was by some distance the weakest of the year. The 2006/07 Russian winter was the warmest since records began in 1879, according to Moscow’s weather service. This particularly benefited the construction sector. Two themes permeate the data. First, investment is very strong and this is powering economic growth. Fixed capital investment soared by 20.1% year on year in January-March 2007, according to estimates from the Ministry of Economic Development and Trade, compared with just 5.7% growth during the year-earlier period. Second, household consumption is buoyant; it played a stronger role than investment in the 11.6% increase in domestic demand recorded year on year in the first quarter of 2007. With real disposable incomes up by 13%, private consumption rose by 12.7% year on year in January-March, according to the economic development ministry’s estimates. This helped to fuel a 13.6% rise in retail sales and a 7.9% increase in the sales of services to the population. Strong domestic demand is also reflected in further rapid growth in imports of goods and services. These were up by 36.8% year on year in January-March 2007; exports, by contrast, rose by 5.3%, with energy exporters still struggling to increase production volumes. Improving access to consumer credit is also helping to fuel demand. Domestic credit rose by 46.4% year on year in 2006 and continued to expand in the first quarter of 2007. The central bank reports a 53.7% rise in the value of rouble credit in 2006, with foreign-currency loans up by a more modest 29.3%. Loans to individuals recorded the fastest growth, on account of rapidly rising consumer credit. Loans to individuals rose by 75% in 2006, or more than twice as much as the 38.6% increase in corporate credit. The rapid rise in lending to individuals comes from a very low base, and is expected to continue, particularly as the government’s emphasis on housing will push up the currently low demand for mortgages. electrical machinery and equipment, with demand for office and computing equipment surging. Consumer demand is also playing a role, as underlined by a sharp increase in the production of televisions. Amidst this strong growth, the oil and gas industry–for years the economy’s mainstay–is struggling. Natural gas output rose by just 0.3% year on year during the first quarter of 2007, with independents faring little better the state monopolist Gazprom. Oil output rose by 4.2% over the same period, primarily owing to favourable weather conditions. Preliminary data for output growth in April show a return to more modest 1.8% year-on-year growth, or somewhat below the 2.6% increase in output recorded for 2006 as a whole. In the absence of a more vigorous performance from oil and gas, can this pace of GDP growth be sustained? The momentum behind the expansion of construction, manufacturing and a clutch of service-related sectors is certainly promising, and strong domestic demand will continue to drive the economy in 2007-08. However, base effects will have a less favourable impact in the rest of the year, as GDP growth averaged over 7% in the final three quarters of 2006, compared with 5% growth in the first. Moreover, buoyant consumer demand will continue to fuel strong import growth and as a result net trade will exert an increasing drag on GDP growth. As a result, full-year GDP growth this year is likely to be within the official government forecast of 6.5-7%. Faster economic growth is unlikely while energy output growth remains sluggish and while Russia’s large-scale investment needs are not–even now–being fully met. A range of problems in the business environment and competitiveness-eroding real rouble appreciation are further obstacles in the path of Russia’s economy. Still, in the context of the near stagnation of hydrocarbons output, Russia’s growth performance is surprisingly robust and well above the long-term trend rate. This concludes our behemoth of a post on Russia’s economic performance in 2007. The next Editorial on the economy will discuss strategies for Russia’s future economic development and possibly the next two chapters of the World Bank’s Russian Economic Report.